Here is an idea for all journalists: use Bambuser to broadcast a livestream video from your phone. The app and mobile site allows you to stream video from no less than 360 mobile phone models. 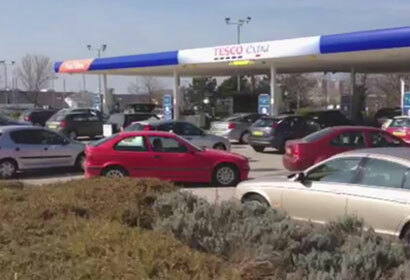 Sky News North of England correspondent Nick Martin yesterday used his iPhone to livestream a report on queues at fuel stations. It wasn’t broadcast live or aired later on Sky news on this occasion but enabled Martin to share live footage with his Twitter followers. A total of 45 watched it live, with current viewer stats standing at 443. We’ve been covering the fuel problems at forecourts across the country. It was just a case of going past a forecourt and seeing pretty lengthy queues of 50 or 60 cars and not having a cameraman with me. It’s a way of getting pictures in real time to Twitter followers or to a news desk. The quality sometimes isn’t great but a way of people being able to plug into what you’re doing as a reporter. Martin said he saw real value in the possibilities during a breaking news story, such as the riots, of the channel broadcasting the phone footage live. Martin explained that Sky News has its own technology to allow reporters to sent high quality phone video footage to the newsdesk. Bambuser has been used by several smaller local media outlets in the UK over the last year but this is the first time it’s been used this way by a nationwide media. Bambuser is a previous app of the week for journalists. Nick Martin spoke about his innovative uses of apps at last month’s news:rewired conference for journalists. Here are Martin’s three pieces of advice for journalists considering using mobile phones for reporting. The liveblog of the session is at this link. This entry was posted in Mobile and tagged bambuser, livestreaming, mobile journalism, Nick Martin, Video on March 30, 2012 by Sarah Marshall. Last week technology firm Blinked.TV demoed its mobile phone app for livestreaming audio and video to delegates at the Digital Storytelling conference (#ds10). The app, which will soon be available for iPhone users, lest you record and stream audio and video, and send text updates. Users can create channels archiving this multimedia content and different permissions, which can be embedded in their sites. Users can also switch between broadcast, audio and text modes without losing connection to a server during the stream, said co-founder Andrew Cadman. The problem that digital journalists have is constantly swapping between applications to do multimedia work. Switching between applications is time lost. According to founder Andrew Cadman the app allows for “digital storytelling with a single broadcast” – an important part of this is the metadata attached to each piece of material. By itself a broadcast won’t tell a story, said Cadman, but with captions and location data attached to it, it can. The app also allows for multiple users to contribute to the same channel from different handsets and locations. Providing high-quality livestreaming is the company’s ultimate aim – current 95 per cent of content uploaded via the Blinked.TV site is streamed live, said Cadman. Blinked.TV will also be trialled by a big UK media group in the next few months and is looking a charging larger companies for use of its embedded channels or charging on a bandwidth use basis. As part of the Digital Storytelling event, Blinked.TV is running a competition offering prizes of £350 for the best individual and best team broadcast produced using the application. The deadline for entries, which will be judged by Blinked and digital journalism collaborative not on the wires, who organised the event, is 3 May. This entry was posted in Events, Mobile, Multimedia and tagged Blinked.TV, Digital storytelling, ds10, Events, livestreaming, not on the wires on March 23, 2010 by Laura Oliver. CNET has a great overview of the traffic surge to news sites caused by coverage of Michael Jackson’s memorial last night. According to the report, Ustream, which provided livestreaming of the event in partnership with CBS, said it was the largest ever event hosted on the service with 4.6 million streams and 12,000 messages posted every minute to the chatrooms surrounding the streams. Figures from web usage monitoring company Gomez International suggest news sites were less available, because of the slowdown caused by video streaming, with some taking nearly triple the time to load pages. This entry was posted in Editors' pick, Online Journalism, Traffic and tagged CBS, Gomez International, Jackson memorial CNET, livestreaming, michael jackson, msnbc, ustream, Video, web holds, web usage monitoring on July 8, 2009 by Laura Oliver.